WBC to order Gennady Golovkin vs. Jermall Charlo after Charlo-Korobov fight on Sat. By Allan Fox: WBC president Mauricio Sulaiman says that the World Boxing Council will be ordering Gennady Golovkin (38-1-1 34 KOs) to face interim WBC middleweight champion Jermall Charlo (27-0, 21 KO) to fight in a final eliminator after Jermall’s fight this Saturday against Matt Korobov (28-1, 14 KOs). If Charlo beats Korobov, then he’ll face GGG with the winner of that fight will be WBC middleweight champion Saul Canelo Alvarez’s mandatory challenger. Charlo is already Canelo’s mandatory challenger after earning the position last year in knocking out Jorge Sebastian Heiland in the 4th round in a WBC 160 pound title eliminator on July 29, 2017. However, the WBC is now going to order a second eliminator for Charlo to deal with in facing GGG to get the Canelo fight. The obvious question is why doesn’t the WBC order Canelo to face his mandatory challenger Charlo? 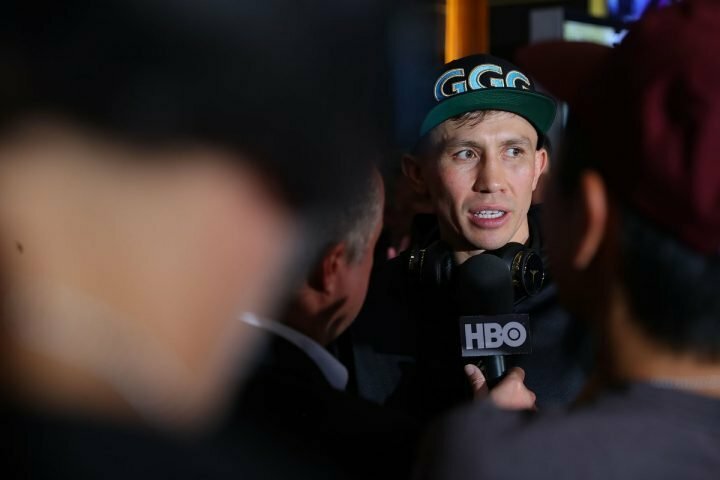 Why should Golovkin need to fight Canelo’s mandatory instead of him? It doesn’t make any sense at all, and it looks to some boxing fans like the WBC is trying to prop Canelo up to keep him as their champion for as long as possible. The WBC’s timing is horrible for them to be ordering Golovkin and Charlo to face each other. Canelo might vacate his WBC title, and move up to 168. So why should GGG fight Charlo in an eliminator to get a fight that may never happen against Canelo? If Canelo skips out, then the winner of the GGG-Charlo fight won’t get the fight that they want against the Mexican star. There’s no way of knowing if Gennady will accept the order by the WBC to face Charlo in a final eliminator to get a trilogy fight with Canelo. With everyhing that Golovkin has gone through with his three-year wait to get the Canelo fight, and then the two controversial decisions from those matches, it’s highly unlikely that he’s going to want to have to earn a third fight with him. The apparently doesn’t see things from Golovkin’s perspective. GGG feels he was rightful winner in his two fights with Alvarez. Additionally, Golovkin is unhappy about Canelo testing positive for clenbuterol while training for their rematch. GGG thinks Alvarez was trying to get an edge against him by using a performance enhancing substance. Golovkin might not be willing to stand in line and fight Canelo’s mandatory challenger Jermall Charlo for him just because the WBC says so. But even if Golovkin is willing to go along with the program and face Charlo, as the WBC wants him to, there’s no way of knowing for sure if a win over the Texas native will get him a trilogy fight. Canelo could walk away from his WBC title by vacating it if Golovkin beats Charlo. Canelo isn’t even certain he’s going to return to the middleweight division. This move by the WBC will, of course, buy Canelo time, since he won’t have to worry about fighting his mandatory challenger Charlo in early 2019. The WBC is going to have Golovkin take care of Canelo’s mandatory for him if he accepts the sanctioning bodies’s order to face Charlo. “The ruling by the convention is Canelo can have a voluntary fight, and then have [Jermall] Charlo fight Gennady Golovkin and then the winner being the mandatory challenger [to Canelo],” WBC president Mauricio Sulaiman said to Thaboxingvoice. “We have a fight on Saturday with Charlo. After then, the process for Charlo-Golovkin will begin. So let’s see what happens Saturday, and then we’ll see what happens with Charlo vs. Golovkin. We’ll see what happens, then the ruling is clear and consistent. We’ll see what happens in the coming weeks,” Sulaiman said. Canelo already had his voluntary fight in moving up to 168 to face WBA ‘regular’ champion Rocky Fielding (27-2, 15 KOs) last Saturday night on DAZN at Madison Square Garden in New York. Canelo will end up having a second voluntary defense obviously now that the WBC is going to force Charlo to face Golovkin in another eliminator match. With the way the WBC has set it up, Charlo will have fought two eliminators and a fight for the WBC interim title before he ever gets a shot at Canelo. Charlo already beat Heiland in a WBC eliminator, and then fought Hugo Centeno Jr. for the interim WBC title after the sanctioning body ordered that fight. It’s unclear why the WBC is ordering Charlo to jump through yet another hoop to get his mandatory title shot against Canelo. It works against Charlo that he needs to go through Golovkin to get his mandatory title shot against Canelo. It’s a good deal for Canelo that he doesn’t need to worry about Charlo for a little while longer, since that’s a fight that he could lose. Canelo might not stay around at middleweight long enough to fight the winner of the Golovkin vs. Charlo fight, if it ever happens. After Canelo’s win over Fielding last Saturday night, he said that he’s not sure if he’ll go back down to middleweight. Canelo wants time to think about whether he wants to return to the 160 pound division. If he doesn’t return to middleweight, then the winner of the Golovkin vs. Charlo fight will be the new WBC 160 lb champion. When asked what happens if Charlo beats GGG, Sulaiman said, “Then the order goes out for the fight [Canelo vs. Charlo], and the date. So if there’s no agreement, we’ll go to a purse bid. If either fighter decides not to particulate in the process, then everything stops, and then we have to look at the next ruling. I hope that if Charlo wins on Saturday, and then the fight with Charlo and Golovkin will be a huge fight. Then positions for a huge event in 2019 with the winner fighting Canelo,” Sulaiman said. Charlo might not win on Saturday against Korobov. This is a fight that isn’t a sure thing like Charlo’s recent matches against Hugo Centeno Jr. and Jorge Sebastian Heiland. Korobov is a guy with power, size, a southpaw stance, and he’s a 2008 Olympian. If Korobov is close to the form that he had earlier in his career, he could win on Saturday night and leave the WBC having to order a title eliminator between two fighters in their mid-30s. Golovkin vs. Korobov would be an interesting fight, to be sure, but it’s two guys that won’t be around for much longer in the sport. A young fighter like Charlo will be around for at least another 10 years before he calls it a day and retires from boxing. It works out better for the WBC if Charlo beats Korobov and then defeats GGG in a final eliminator to get the Canelo fight. Canelo vs. Charlo is win-win situation for the WBC, as they end up with a young, talented fighter no matter who wins that match. “That would go to the WBC board of governors,” Sulaiman said about the possibility of Canelo choosing to fight Golovkin in a trilogy match without GGG facing Jermall first, as ordered by the WBC. “If there’s a request for Canelo-Golovkin, we will have to do a voting. My personal opinion is the WBC will accept that fight. If there’s any other different requests then what I’ve explained, then the WBC will evaluate and makes a voting on the matter. Where we stand today, we’re waiting for Charlo to win, and then Charlo to engage in the fight with Golovkin, and then the winner with Canelo. Anything different from that would have to go through with the WBC board for a vote,” Sulaiman said. It’s pretty clear that Sulaiman and the WBC will sanction the Canelo vs. Golovkin trilogy fight if the two of them decide to face each other rather than dealing with Charlo. If the WBC didn’t sanction the Canelo-GGG 3 fight, then they could end up watching Canelo vacate their WBC title for the second time. If Canelo wants the third fight with Golovkin, he’s not going to wait for the WBC to bless it and give him their permission. Canelo will take the fight with GGG when he wants it. Right now, it doesn’t look like Canelo fancies the trilogy fight with GGG. Boxing » Gennady Golovkin » WBC to order Gennady Golovkin vs. Jermall Charlo after Charlo-Korobov fight on Sat.